Offering you a complete choice of products which include digital programmable counter. Due to our vast industrial experience and knowledge, we are counted among the best name of the marking offering Digital Programmable Counter. 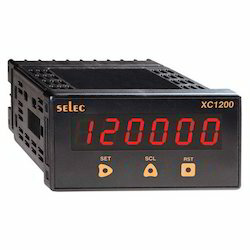 Our offered programmable counters are used to perform up-down counter or length counter with Rate Indication in different industrial applications. This programmable counter is used in various plastic and textile industries and is made up as per the set industrial standard. We use finest quality raw materials and sophisticated technology in order to compete with quality standard.